At the risk of being too “geeky,” not all markets will be profitable with all systems. Part of being successful trading is to know which strategies to apply to which markets. We can never be perfect because economics and supply/demand can change, but most markets can be put into a category that favors one trading method over another. For example, if you’re a macrotrend trader, holding positions for weeks or months, then the Eurodollar interest rate futures is the all-time favorite. It closely tracks Fed action, which evolves slowly, hence it has a strong trend and little distracting noise. At the other end of the spectrum are the equity index markets, which have high noise relative to the net price change. Don’t be fooled by a few years of S&P trending, in the long run it’s only the slowest trends that work, avoiding the frequent dips. The numerator is the absolute value (always positive) of the change in price from N days ago (t-N) to today (t). The denominator is the sum of all the daily price changes, each taken as a positive number. If prices only go up over the N days, the value of ER(t) = 1. If they go up and down a lot, then the value of ER(t) will be near zero. The conclusion is simple. Markets with low noise favor trending systems and markets with high noise favor mean reversion. If you use the wrong markets, you’ll struggle to make money. It’s going to be difficult to show an entire research study including different strategies and results, so we’ll show a sample of trending and noisy markets beginning in 2004. The data interval does change the results, so looking at a longer period would give more consistency, but for ETFs it’s difficult to go back very far. 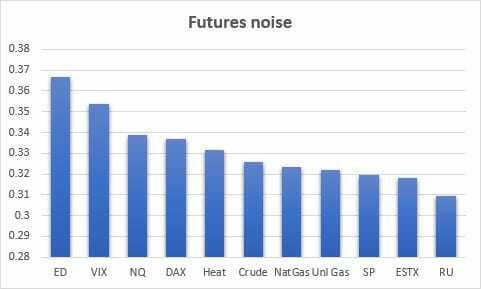 Noise is not the same as volatility. Volatility is only the change in price, daily for us. The ER value can be zero (high noise) when prices are unchanged no matter what the volatility was. Almost any sideways period will show high noise. At the other end, if you have high volatility but an even larger price move, and the ER value be high (relatively low noise) so that a fast trend will still work. Let’s look as some sample markets. Chart 1 shows annualized volatility of a selection of futures markets (left) and ETFs (right). 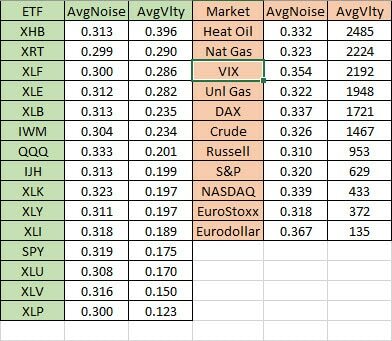 For futures, heating oil and natural gas are the most volatility, while Eurodollar rates and EuroStoxx are the least volatile. When choosing markets to trade, a mean reversion strategy prefers high volatility, but not if prices are making big directional moves at the same time. For that we need to look at noise. 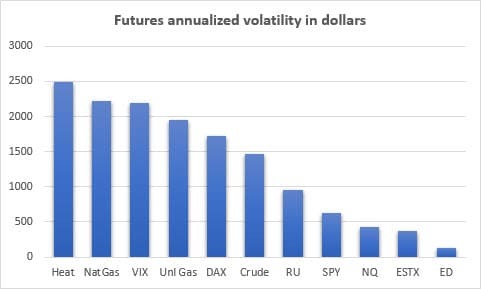 Chart 1 (Left) Futures annualized volatility expressed in dollars. 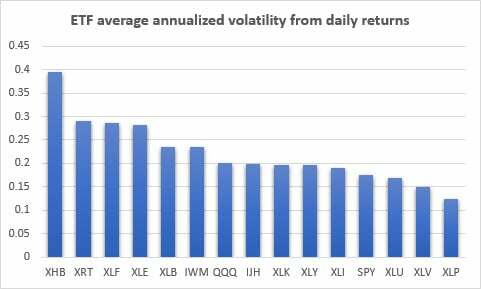 (Right) ETF annualized volatility from daily returns. 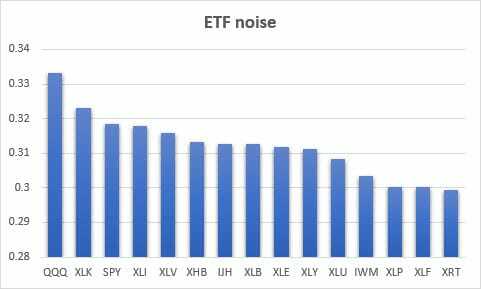 Using the same markets, Chart 2 shows the ranking of futures and ETFs according to noise. For futures, Eurodollars has the highest ER value, meaning the lowest amount of noise. We take that as the best trending candidate and, combining it with the lowest volatility (in Chart 1), we have an ideal situation. For ETFs the best choice is NASDAQ (QQQ) followed by the technology sector (XLK). Both have a medium amount of volatility, which means they will need a slower trend, but still are good for trending. 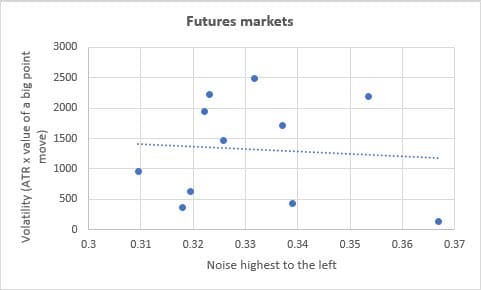 Chart 2 (Left) Futures noise. 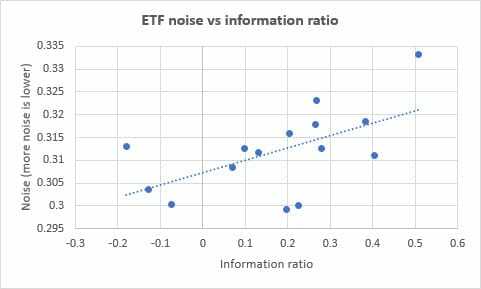 (Right) ETF noise. If you’re looking for mean reversion markets, the you want the highest value of volatility and the lowest ER value. You should start by looking at the noise, which mean prices aren’t going anywhere relative to the volatility. Then the Russell is the best choice in futures, while IWM is about the lowest ER value in ETFs. EuroStoxx is also good, but has low volatility. To find the best combinations for mean reversion, we can create a scatter diagram of noise versus volatility, looking for the lowest ER value and the highest volatility. In Chart 3, the best trending markets would have low volatility (the bottom of the left scale) and a high ER value (right on the bottom scale). The point in the left chart, far right, bottom corner, is Eurodollars. The best mean reversion markets would be diagonally opposite, in the upper left corner. The dotted straight line is the regression through those points. Because it is nearly horizontal, it shows that there is no relationship between volatility and noise. Table 1 shows the numbers used for these charts, so that you can make the decisions for yourself. Chart 3. 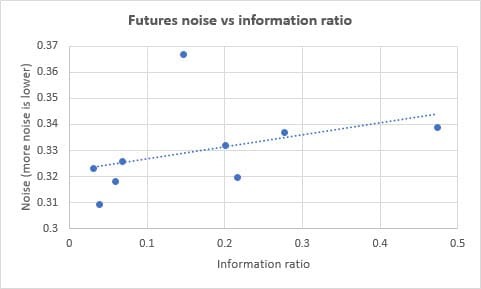 Noise (ER value) versus volatility. (Left) Futures. (Right) ETFs. Table 1 (Left 3 columns) ETFs with ER value and annualized percent volatility. (Right 3 columns) Futures with ER value and annualized dollar volatility. This is all theory until you run a trend-following system using these markets, then compare the profits against the noise value. Remember that this is a small sample and chosen without first looking at the results; therefore, the results will be realistic rather than optimistically good. Such is real life. We will expect the markets with low noise (high ER values) to perform better with trend following, and those with high noise (low ER values) to be best with mean reversion. We won’t show mean reversion results, only infer them from the trend performance. There are too many ways to implement mean reversion. We’ll use a 120-day trend to capture the idea of a macrotrend. Chart 4 is a scatter diagram of the trend-following results versus the ER value. Trend-following results are expressed as an information ratio, annualized returns divided by annualized volatility, my best measure of reward to risk. Futures (left), show Nasdaq at the far right, Eurodollars at the top, and the Russell, EuroStoxx, crude oil, and natural gas clustered at the bottom left. This means Nasdaq was the best performer while Eurodollars was modestly profitable with low noise, no doubt due to the flattening and turning of short-term rates in the past few years. The cluster on the bottom left would be the best candidates for mean reversion. Chart 4. Trend-following results, expressed as an information ratio (annualized returns divided by annualize risk). (Left) Futures markets. (Right) ETF markets. 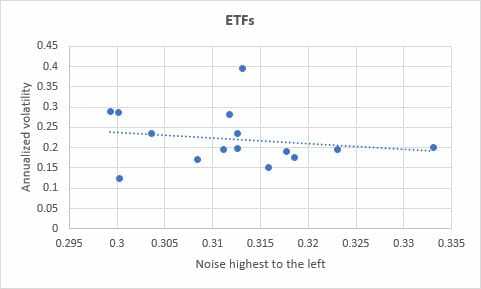 For ETFs, the relationship between noise and profits is much stronger, as seen by the angle of the regression line. Nasdaq (QQQ) is again at the top right, consistent with futures, and IWM, XHB, and XLP at the bottom left, the best choices for mean reversion. The best (Nasdaq) and worst (Russell) are consistent across both futures and ETFs. Two other good markets at the upper right are XLK (technology), and SPY (sector SPDRs). While there is a gray area in the middle where a market may be good for both trending and mean reversion, the extremes are clear. A high ER value is good for trends, and a low value is good for mean reversion. If you only eliminate the worst offenders from your portfolio, you will significantly improve your results.